1. 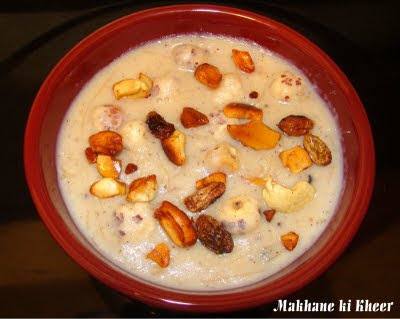 Heat ghee in a frying pan and fry raisins, cashews, almonds. Take out from the pan and keep aside. 2. Add phool makhana to the same pan and fry them for few minutes in medium heat. Let it cool and grind them into coarse powder. Keep aside. 3. Add milk to a large vessel, bring it to boil. Now add vermicelli and powdered makhana. Let them cook for few minutes and stir continuously. 4. Add sugar and mix well. Cook for 5 minutes in low heat. Finally add dry fruits and cardamom powder.